Duluth Harbor in Minnesota has three pier lighthouses. 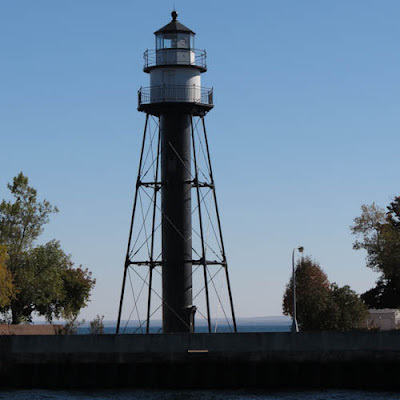 On a recent visit we stopped by the harbor to visit the lights and were delighted to find a newly renovated harbor area with easy access to all three lights. Our first stop was the north breakwater light which was found adjacent to the parking lot for the area. 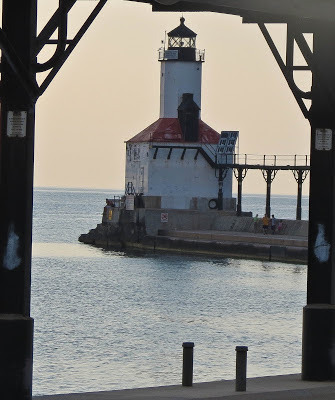 The black and white conical light is found at the end of the 1700 foot pier. 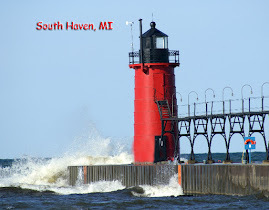 It was a beautiful fall day when we visited so my husband and I enjoyed our stroll down the pier to see this lighthouse. I was able to photograph the light from a variety of angles. Our next light was just a short distance away on the other side of the canal. To reach it we crossed the lift bridge and proceeded down a second 1700 foot pier. This light is like a small house with a light tower jutting out of it. The bright red roof makes it easy to spot. 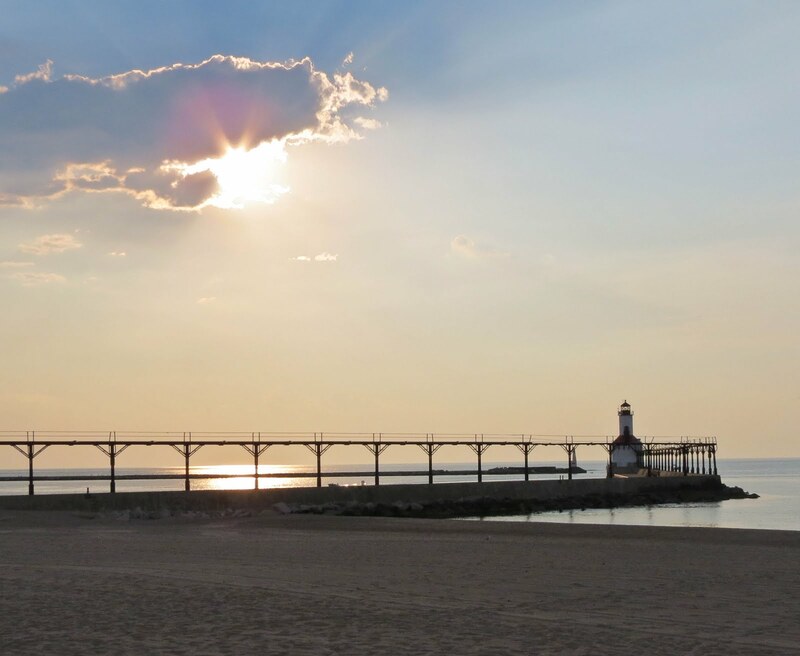 Michigan City Indiana has had three lighthouses over the years. 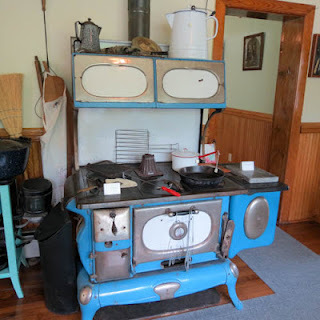 The first was built in the 1830's and is no longer in existence. 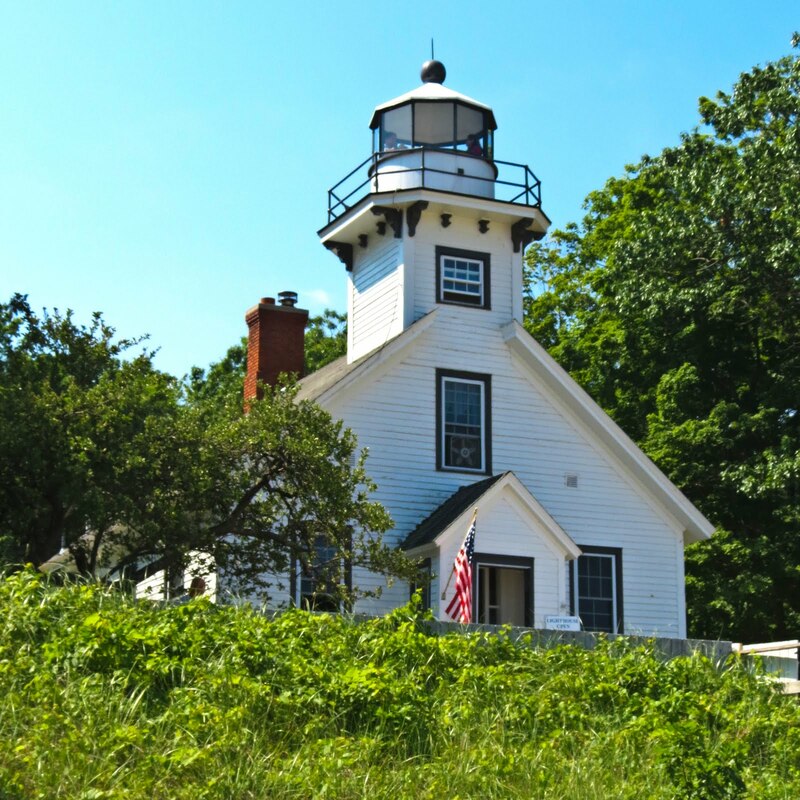 The lighthouse pictured here was built in 1858. 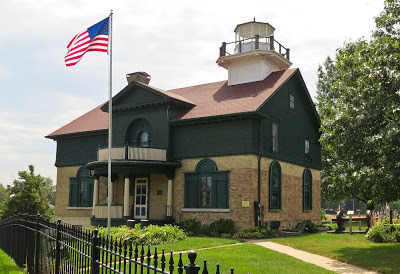 It had one lighthouse keeper for 43 years from 1861 until 1904- Miss Harriet Colfax. This lighthouse now houses a museum on the lighthouses. The day we visited Michigan City the museum was closed so I had to be content with wandering around the perimeter of the house and taking photographs. 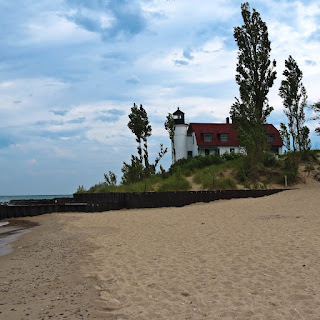 Not far from the old Michigan City lighthouse we found the east pierhead lighthouse. It can be accessed by walking down a 1500 foot elevated catwalk. The sun was beginning to set and I was able to shoot several different shots of the "East Pierhead Light". 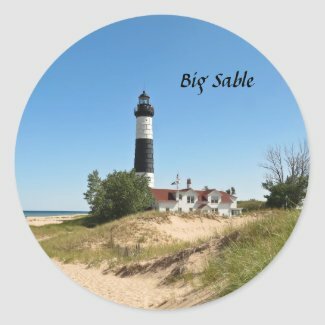 Create unique custom magnets at zazzle.com. Lighthouses have always fascinated me and since my retirment 6 years ago, I have traveled to and photographed 60 lighthouses. The one thing I have always wanted to do is to stay all night in a lighthouse and this fall I got my chance. 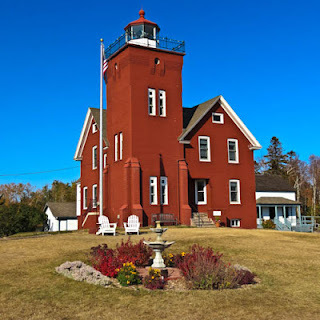 While looking for a place to stay for our Minnesota fall excursion, my husband found a lighthouse bed and breakfast that had an opening for one of the nights we would be in the area. We found Two Harbors lighthouse to be a delightful place to stay. It is a working lighthouse and has three guest bedrooms on the second floor. We stayed in the Harbor room which had a window looking out on the harbor. When a large ship left the harbor just after midnight, I got out of bed and watched it from our window. What a great treat! Staying in the lighthouse enabled me to take photos at all times of day and night and I was really excited when I realized it was the full harvest moon while we were there and I was able to capture this photo of the lighthouse and the moon. Then when the first rays of sunlight peaked over Lake Superior in the morning, I was again able to go outside and get some great shots. 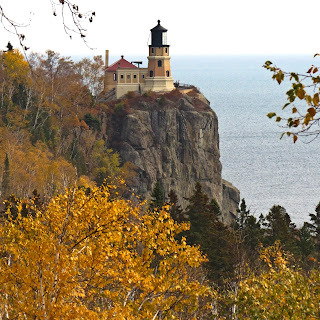 We took a fall trip to Minnesota to photograph the lighthouses and the fall foliage. I had heard that Split Rock on Lake Superior was a great lighthouse to photograph so I was really looking forward to seeing it. 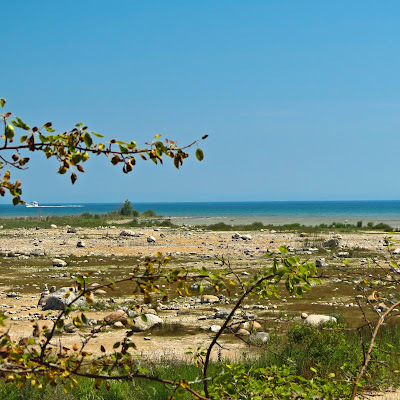 I got my first view when we stopped at a roadside viewing area about 1/2 mile from the lighthouse. I was amazed at the great view of the lighthouse from this distance. It was a cloudy day and the sky was grey but I was able to get this photo of the lighthouse with the pretty fall foliage in the foreground. The next day was a brighter day so we headed out in the morning to the state park where the Split Rock Lighthouse is located. I wanted to get some more photos from the area near the shore and then I was planning on touring the lighthouse. 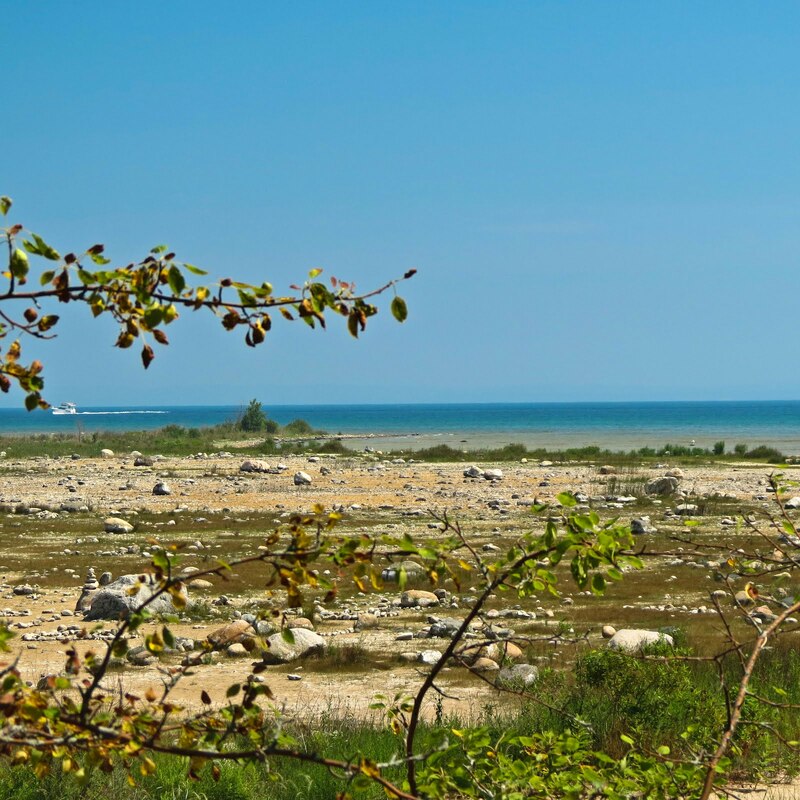 I walked on several trails near the lighthouse looking for a perfect spot for a photo. 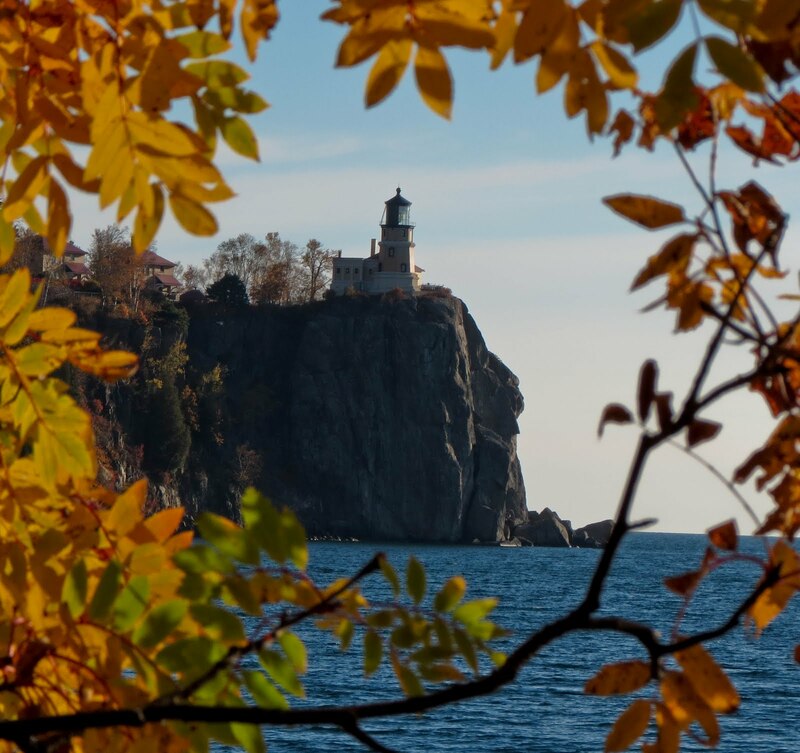 I ended up taking over 100 shots, but I think the one below of the lighthouse framed in the fall leaves, is my favorite. 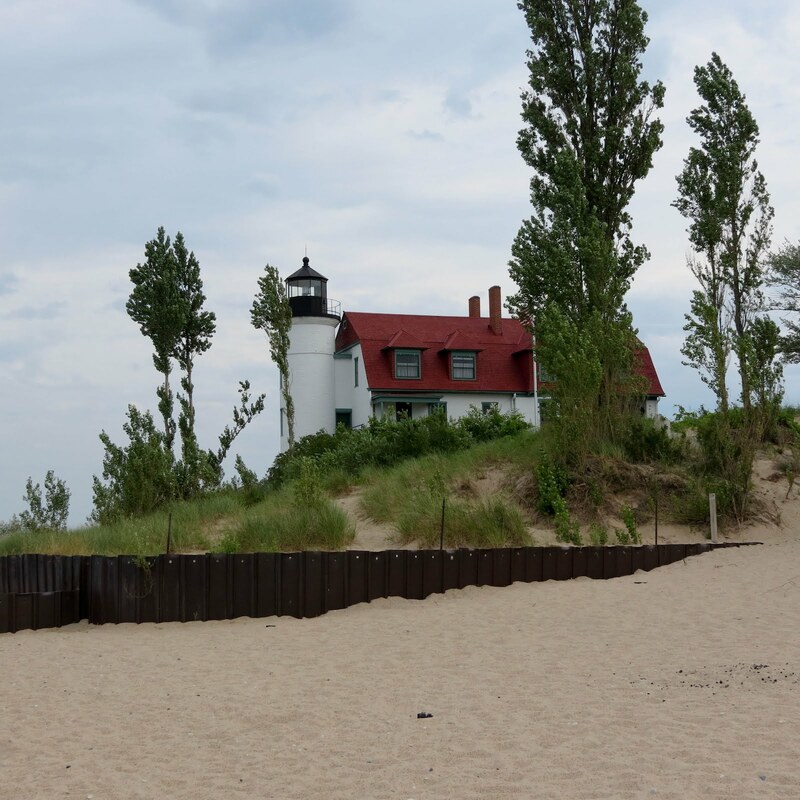 After finishing shooting from the shoreline, I took a tour of the lighthouse and lighthouse grounds. 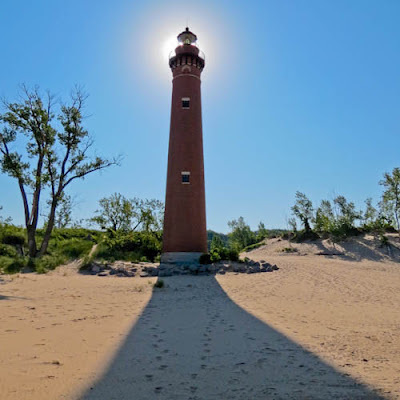 It is a fairly short lighthouse with only 32 steps to reach the top of the tower. The location high on the cliff is what gives the lighthouse a prominant position for warning ships from the coast. Here is my favorite photo taken up close to the lighthouse. Point Betsie Lighthouse is found on the shores of Lake Michigan just north of Frankfort, Michigan. It is located at the southern edge of the Manitou Passage. 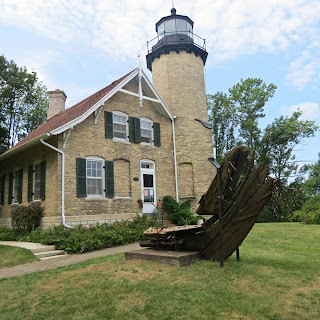 When we visited the lighthouse, I was able to go inside and take a tour of the lighthouse and the grounds. 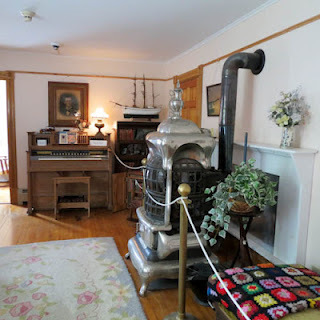 The lighthouse had a house for the keeper on the main floor and the second floor had a small apartment for the assistant keeper. 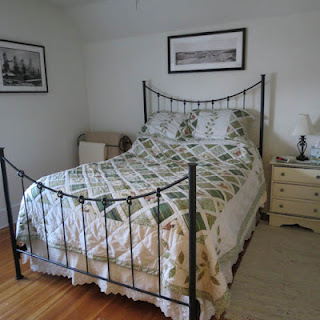 The assistant keeper's quarters is now available for rent and has two bedrooms, a kitchen and a comfy living room. 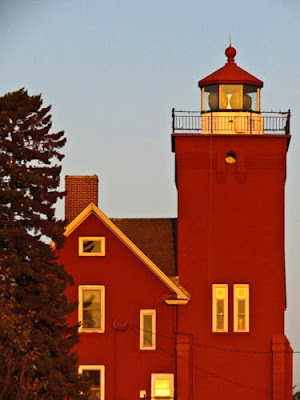 I think it would be great fun to stay in a lighthouse! This image of Point Betsie lighthouse was taken from the beach. The lighthouse was built in 1858 and has a beacon that shines 52 feet above the lake and has a range of about 15 miles. It helped ships to navigate the dangerous Manitou passage. After touring the lighthouse, I walked down the beach a bit and was able to get this view of the lighthouse. It was a cloudy day and in fact starting raining just a short time after we left the lighthouse. This photo show the expressive clouds in the sky. 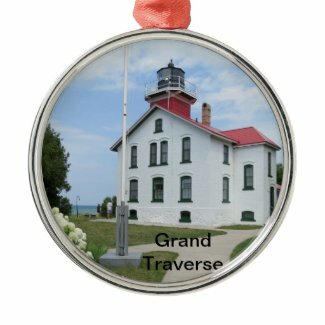 Grand Traverse is a beautiful lighthouse that is located at the tip of the Leelanau Peninsula in Michigan. 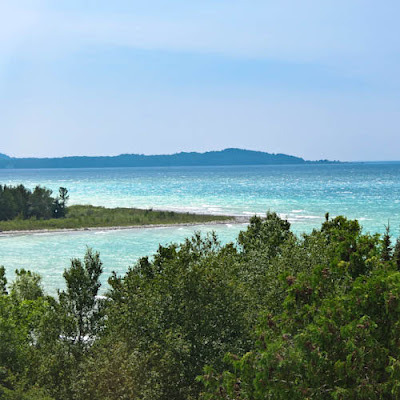 The peninsula separates Lake Michigan from Grand Traverse Bay. 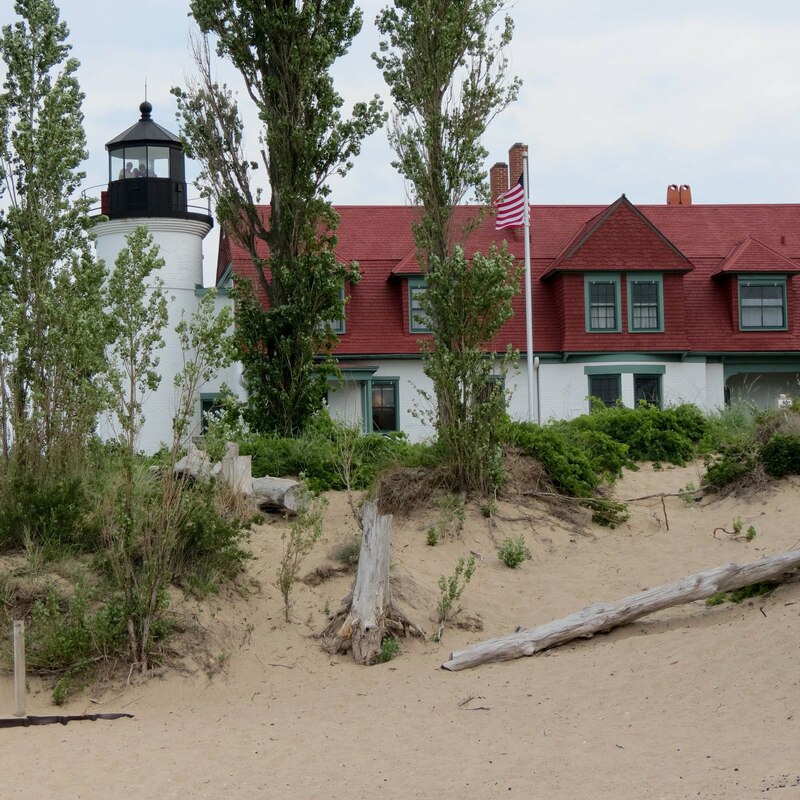 The Grand Traverse lighthouse was built in 1858 and operated until 1972 when it was closed and an automatic light tower was constructed. 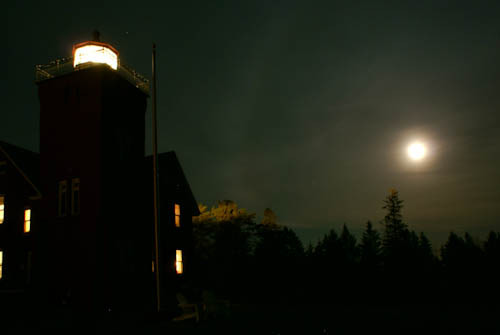 In 1986 the lighthouse was made open to the public. 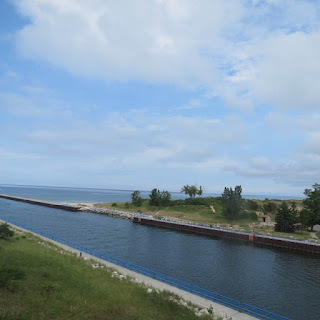 In July of 2012 I was able to visit the lighthouse, take a tour of the lighthouse, and climb the tower. I found the inside of the lightouse to be very interesting. In many of the lighthouses that I have visited the keepers quarters are small and quite sparsely furnished. This was not the case at Grand Traverse. The house was rather large and was very nicely furnished for the period in which it was used. There was even a formal dining room complete with china,silver and crystal. The preserved museum in the lighthouse gives visitors a look at how the lighthouse keepers lived at the turn of the century. The actual lantern room protrudes from the pitched roof of the building. 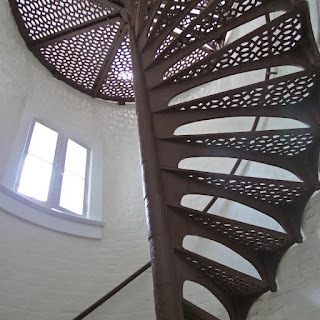 I reached it by climbing to the second story and taking two short staircases that led up to the lantern room. The view of Grand Traverse Bay from the top was beautiful. 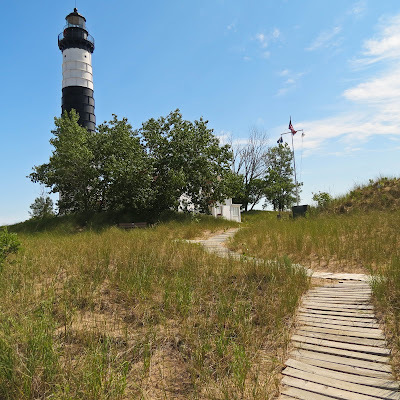 The lighthouse at Big Sable Point was my favorite lighthouse on our latest Michigan lighthouse tour. Big Sable was built in 1867 and was originally named "Grande Pointe au Sable" which means "Big Point in the Sand". In order to see the lighthouse, I had to take a two mile trek up the beach. As I rounded a bend on about the last third of the walk I saw Big Sable sticking out among the sand dunes. What a beautiful sight! The lighthouse is open to visitors and I visited the inside of the lighthouse but this time I didn't climb the stairs to the top. I'll have to admit after that long trek up the beach my legs were a bit shaky and I couldn't quite seeing climbing the 112 foot tower. I was able to walk the grounds and took photos from all different angles. The walk was definately worth it, the views of this lighthouse were stunning. Originally the lighthouse was brick and looked much like Little Sable Lighthouse. In 1900 it was found the the brick was badly damaged by the weather and the lighthouse was covered with a steel cladding. This black and white design is what you see today. 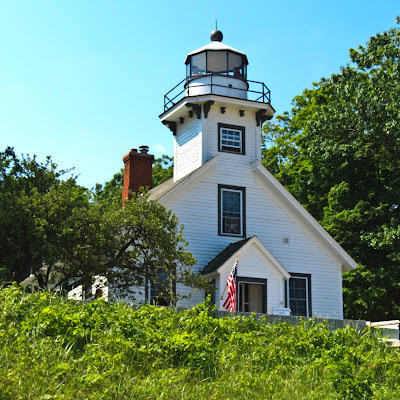 Located at the top of the Old Mission Peninsula in Michigan, the Mission Point Lighthouse is a reminder of what life was like for lighthousekeepers at the turn of the century. 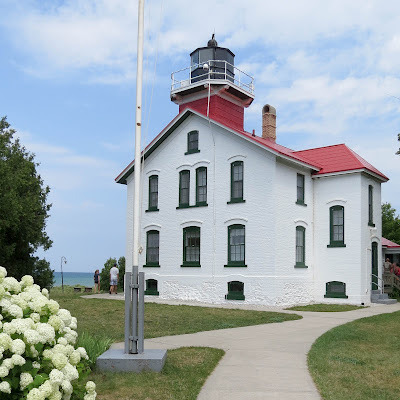 To reach the lighthouse you travel the M37 from Traverse City up the Old Mission Peninsula. The 18 mile drive is beautiful with vineyards and orchards lining both sides of the road. There are also many wineries where you can stop and taste some wine. The photo above shows the first view we had of the lighthouse after we left the parking lot. 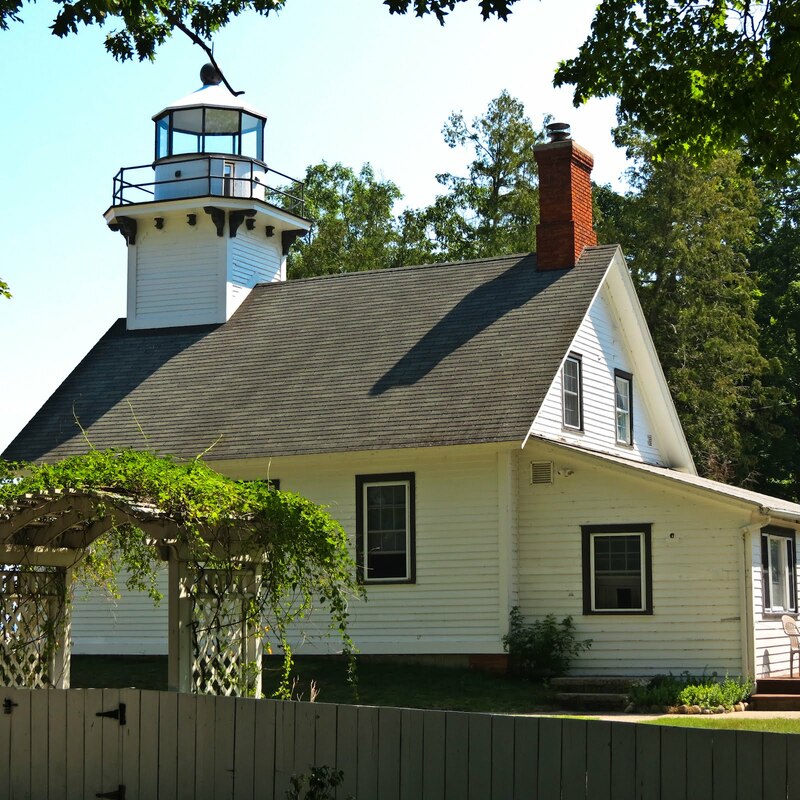 An interesting fact about Mission Point Light is tha is is located on the 45th parallel of latitude. That is halfway between the north pole and the equator. 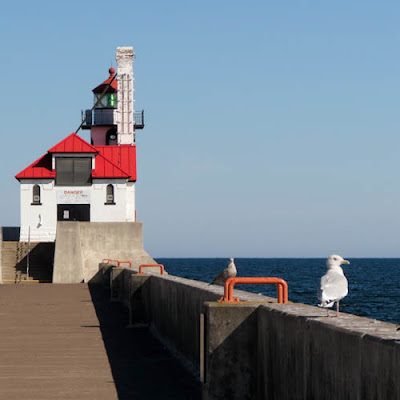 There is a sign at the lighthouse grounds showing other cities that also lie within the 45th parallel. It is interesting that many of them are also known for their wines. On the lighthouse grounds there is a log cabin that was built in 1856. 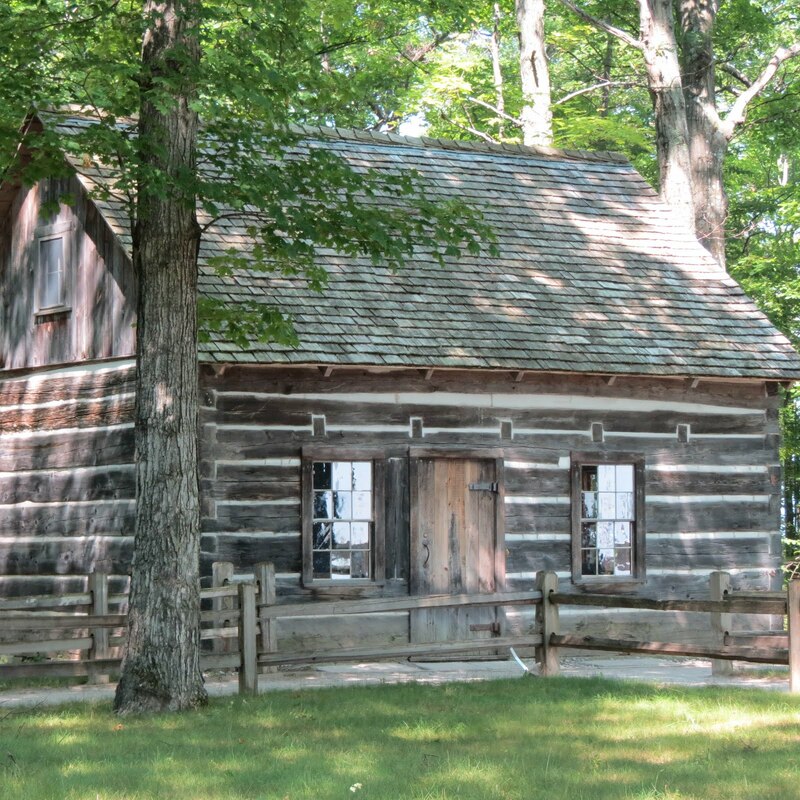 You can step inside and get a hint of what life was like in northern Michigan in the 19th century. 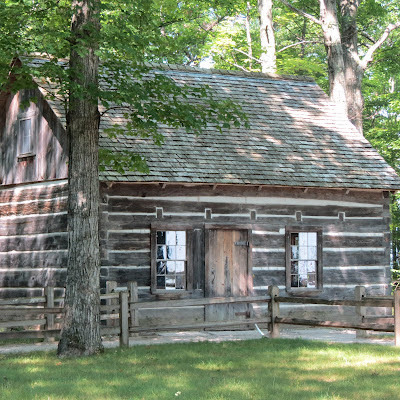 The photo below is the Hessler cabin. At the lighthouse visitors can tour the building and if they are interested climb the tower for a view of Traverse Bay. This photo shows the bay from the lighthouse. We really enjoyed our day visiting the Old Mission Lighthouse. It was a great way to spend a Sunday afternoon. The White River Light Station is located on the west coast of Michigan near Whitehall. This charming old light station was built in 1875 to help ships maneuver the channel between White Lake and Lake Michigan. There were many sawmills built around White Lake near the great pine forests. Lumber schooners would travel this route to bring their lumber to market. The light station aided in navigating the ships through the narrow channel. 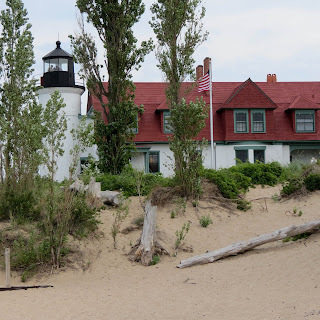 When we visited the Michigan coast in July, I was able to visit the light station. It was decommissioned in 1960 and is now open as a museum. Visitors can climb the tower for a view of the chanel as it goes into the lake. The museum in the light station is small but interesting. 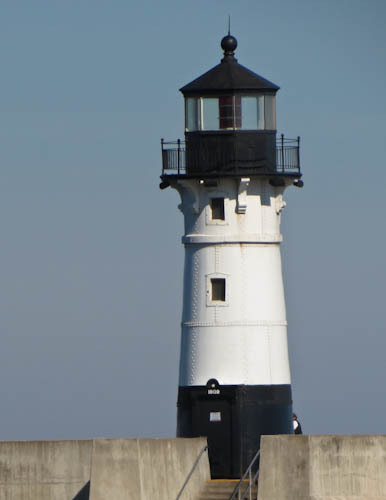 It has several scale models of the lighthouse that have been made over the years. There is memoriablia from the keepers that lived in the lighthouse over the years. 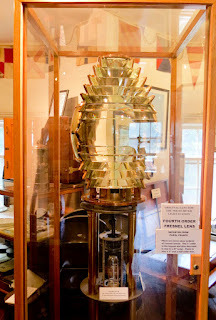 It also houses the original fourth order fresnal lens from the light station. 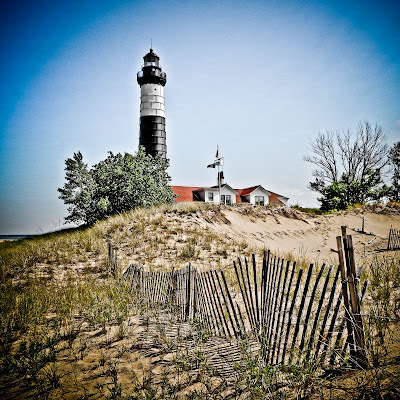 Along the western coast of Michigan are many beautiful lighthouses. 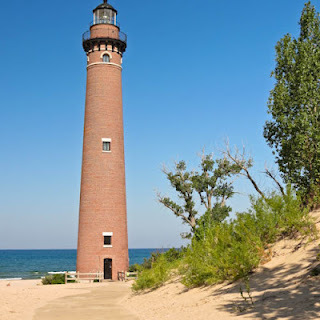 One of my favorites is a historic red brick lighthouse called Little Sable Point. 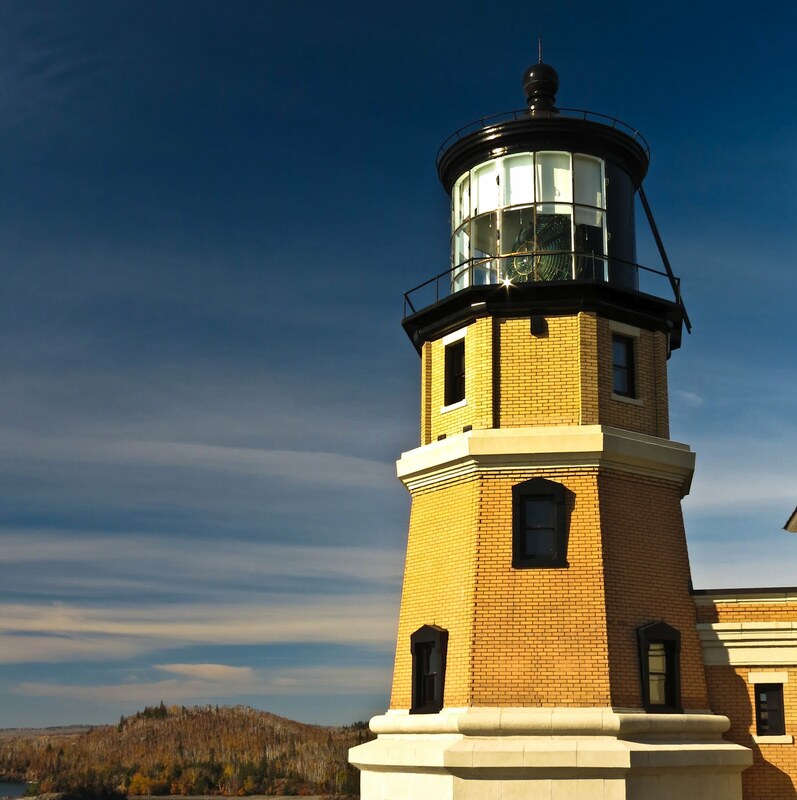 This lighthouse was opened in 1874 and stands 115 feet tall. Originally the tower had a keepers house that was attached by a walkway, but this keepers house was torn down after electrical power was brought to the lighthouse and a constant keeper was no longer necessary. Today the beautiful lighthouse is now open to visitors who want to climb the 139 cast iron steps to the top. I visited the lighthouse one morning before the lighthouse was open and walked around the ground photographing the lighthouse from various angles. 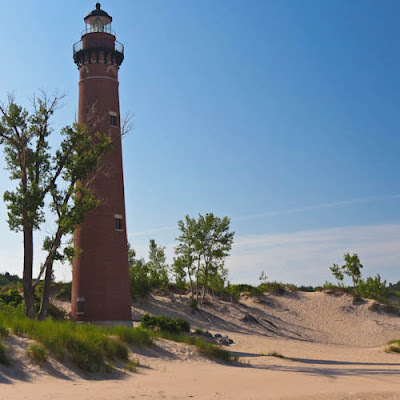 I really enjoyed the views of the lighthouse among the sand dunes on the coast. I was able to take some unusual photos when I noticed the sun was rising just behind the light. Here is one of the resulting photos. You can read more about my photographing adventures on this page Unique Lighthouse Photography. 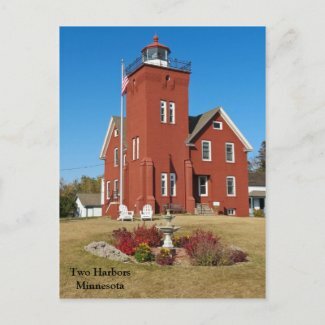 If you love lighthouses, like I do, you probably also like to decorate your home with lighthouses. I have a display of lighthouses replicas that I have collected on my visits to lighthouses and a lighthouse lamp. In addition I have framed photos of lighthouses throughout my house. 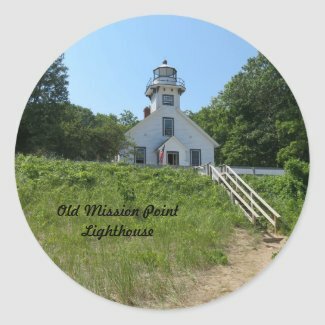 I work with my lighthouse photos in my Zazzle store Lighthouse Enthusiast and I am very excited about the new partnership that Zazzle has just created with a company called American Mojo . This company has some wonderful products all handmade in the USA by single Moms. The objective of the company is to help moms who are at or near the poverty level and provide them employment and relief from daycare issues that usually hinders their employment. 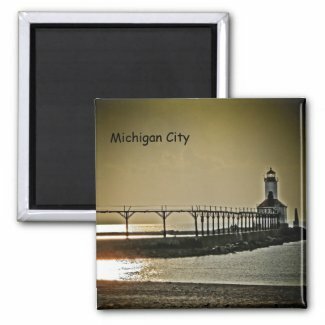 In Zazzle's first release with American Mojo they are offering some great pillows, placemats,napkins,and kitchen towels. To my way of thinking these items just lend themselves to lighthouse decorating. 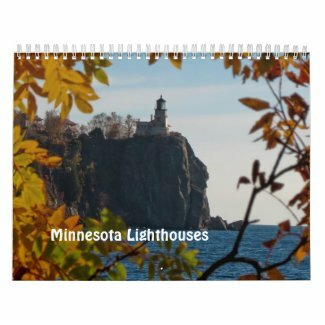 Here are a few that I have featured in my Zazzle shop. 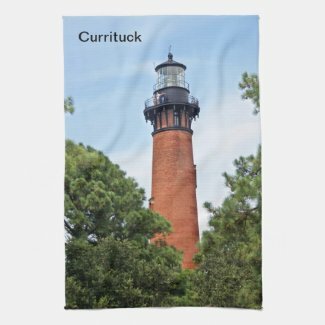 This decorative kitchen towel features Currituck lighthouse in the OuterBanks of North Carolina. 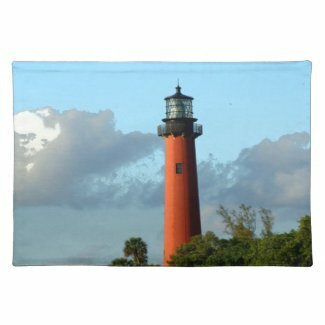 This placemat features Jupiter lighthouse in Florida. There are also matching napkins of Jupiter lighthouse.